APRIL 08 - 10 2016 FRI.- SAT.- SUN. 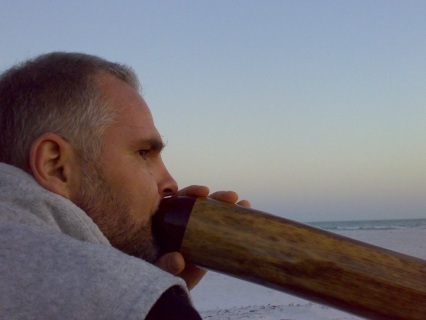 Learn the Art and Science of Playing the Didgeridoo; for Health, Fun, and Prevention of Snoring or Sleep Apnea. The Didgeridoo is being acclaimed as a tool that can reduce snoring and or sleep apnea. There are many scientific studies that demonstrate the efficacy of how circular breathing, required to play the didgeridoo, strengthens the muscles in the back of the throat. This has been proven to be helpful in keeping the breathing passages clear and unobstructed. The vibration of sound also plays a part in opening the throat. Normen Schindowski, is all about Sound, Music, Energy, Talk & Touch. He is a sound practitioner & licensed massage therapist, practicing in Sarasota. With his unique approach to Self Healing via Sound, by using Didgeridoo, Tibetan Bowls, Voice, Breath and Intention, he brings a high vibration of awareness and presence. With his passion to study and discover, he has reached a level of understanding which allows him now, to share his knowledge. Come and learn some basic coaching ideas of how to play the Didgeridoo. Full Workshop May 18th. through June 1st.